Chantier Naval Couach (CNC) launched another Couach 2800 Open last week, called Noé. Ordered at the end of 2011 for a repeat client, the 28.6m Noé is the fourth hull in this series. Designed by the yard, this sleek motor yacht has already proven her seaworthiness and extreme manoeuvrability in the past. She's easily distinguishable from her sisters thanks to a completely white paintjob. The interior accommodates eight guests in four cabins, including a full-beam master suite, a VIP and two twin cabins. Noé is powered by twin 2,400hp MTU engines giving a top speed of 38 knots and a cruising speed of 27 knots. 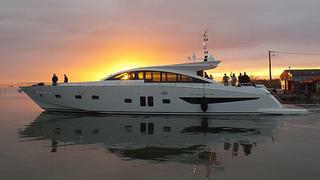 Currently undergoing sea trials, Noé will be delivered to her owners at the end of the month.